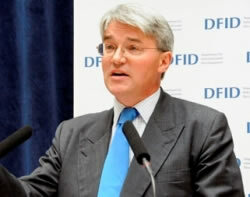 The storm surrounding Andrew Mitchell continues to grow, with the Financial Times today reporting that Whitehall officials were drawing up plans to reclassify energy department programmes as aid. Aid for climate change is a controversial issue, with many in the NGO community long demanding that aid to help poor countries adapt to the impact of climate change must not be taken from rich countries’ existing aid commitments – to do so would see poor countries effectively paying for a problem they did not cause. That is why Labour imposed a cap on climate finance spending by the Department for International Development, which from 2013 will prevent the department spending more than 10 per cent of its budget on carbon reduction. As reported by Left Foot Forward, the Coalition Programme made no such commitment, leaving open the option of either transferring the Department of Energy’s £250m annual budget for international climate finance to DfID, or redefining the spending as overseas development aid. Appearing before the international development select committee last month, Mr Mitchell refused to clarify if the 10 per cent cap would remain until after the Comprehensive Spending Review and his discussions with the climate change secretary. Today’s FT article gives the surest indication yet that those discussions will result in the scrapping of that cap. As the FT points out, the template for reclassifying projects as development aid could be replicated across Whitehall, expanding Britain’s aid programme to include various Foreign Office and Ministry of Defence programmes. This potential raiding of DfID’s budget again raises key questions of leadership; firstly, of Mr Mitchell himself: is he strong enough to stand up for DfID and its budget in the Cabinet? If he can’t defend the budget from DECC, how will he stop his more senior Cabinet colleagues in the Foreign Office and Ministry of Defence? When David Cameron announced in June £200m of support for Afghanistan through the DfID budget, Labour argued that some of this could have come from other departmental budgets – a sign of things to come? Secondly, questions will be asked of the Liberal Democrats and Nick Clegg. As Left Foot Forward reported previously, the Lib Dems have gone AWOL on their manifesto promises on international development. Specifically, their pledge on climate aid went further than Labour’s, promising a complete cap on climate aid so it would be 100 per cent additional. So where are the Lib Dems now? Only weeks away from a key UN summit on the Millennium Development Goals in New York at which the deputy prime minister is due to appear, instead of clear red lines and objectives we have only a leaked documents showing plans to abandon over eighty key international committments. On Wednesday Mr Clegg found himself red faced when it emerged the children’s centre he was visiting was being cut by his coalition partners; if he doesn’t intervene to stop the development secretary’s proposed cuts, he may find himself singing the blues and waking up to greater embarrassment in New York. Personally I have no problem with spending DfiD money on things that benefit poor countries as well as the environment. Spending money on climate change, such as on reafforestation will help poor farmers. We should also spend Dfid money on combatting biodiversity loss. Biodiversity loss is as big a problem as climate change and will impact on poor farmers and poor governments. Biodiversity is one of a countries biggest assets for agriculture and pramecuticals etc. Money spent on this is vital. @John Lees – absolutely, Britain should help poor countries deal with climate change, the environment and biodiversity – we’re in total support of that, but we think the money to pay for that should be additional to our existing aid commitments. A polluters pay principle. Yes its inevitable the aid money has to be reformed for combating CC. You can’t just work on 07% GNI (which while nice is outdated). Given that, no one has thought of how to solve poverty first. Now it’s CC. How do we blend the two togther.